The GEMM lab is adventuring out into the wild blue yonder of open ocean sampling and educational outreach! Leigh is the chief scientist onboard the R/V Oceanus for the next two days as we sail through Oregon waters in search of marine megafauna. 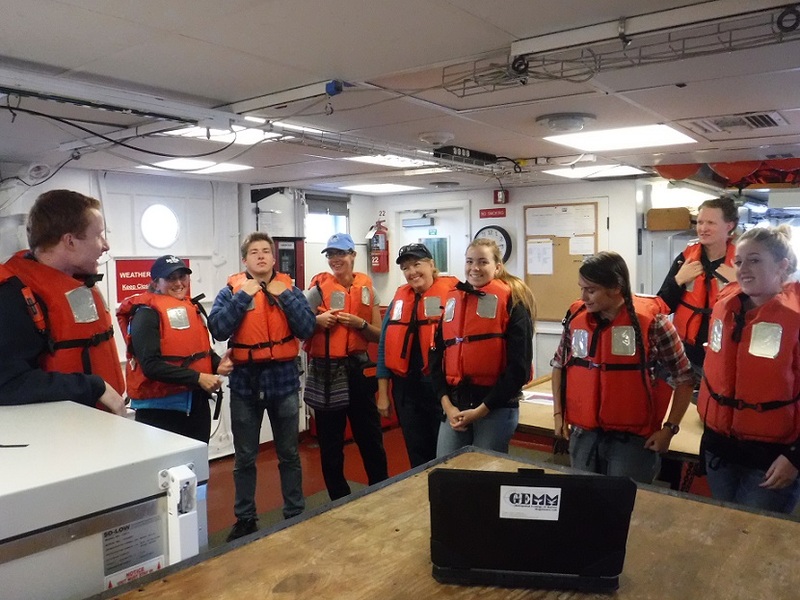 Also onboard are four local teachers and five high school students who are learning the tricks of the trade. Amanda and I are here to help teach basic oceanography and distance sampling techniques to our enthusiastic students. 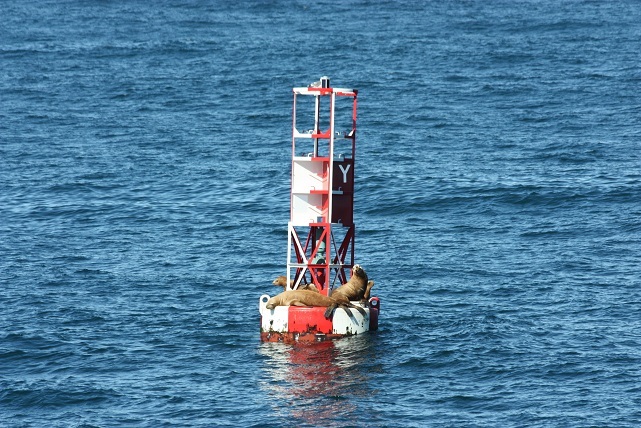 We started the morning with safety briefings, and headed out through the Newport breakwater, direction: Stonewall Bank. Stonewall is a local bathymetric feature where upwelling often occurs, leading to a productive ecosystem for both predators and prey. Even though our main sampling effort will be offshore this trip, we didn’t even make out of the harbor before recording our first gray whale and California sea lion sightings. Our students (and their teachers) are eager and quick to catch on as we teach them new methodologies. Amanda and I had prepared presentations about basic oceanographic and distance sampling methods, but really the best way to learn is to jump in and go. We’ve set up a rotation schedule, and everyone is taking turns scanning the ocean for critters, deploying and recovering the CTD, logging data, and catching plankton. 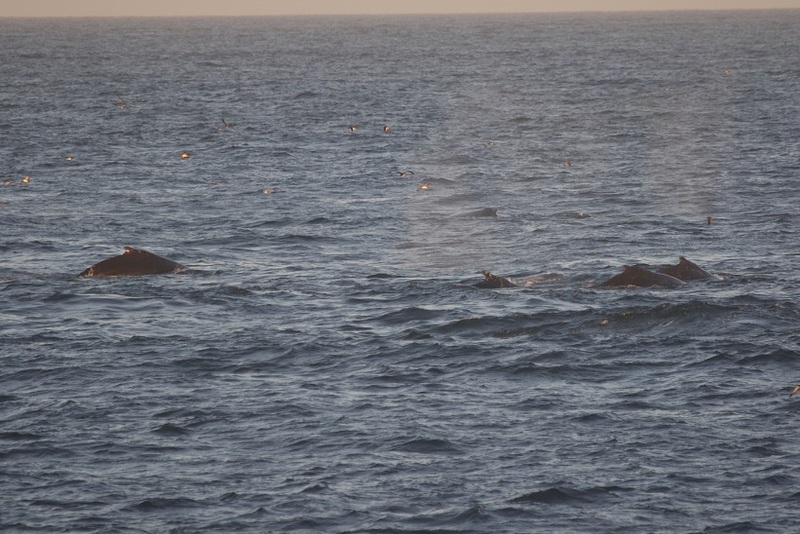 So far, we have spotted gray whales, sea lions, a pod of (lightning speed) killer whales, lots of seagulls, northern fulmars, sooty shearwaters, storm petrels, and cormorants, but today’s highlight has to the last sighting of ~42 humpback whales. We found them at the Northern edge of Heceta Bank – a large rocky reef which provides structural habitat for a wide variety of marine species. 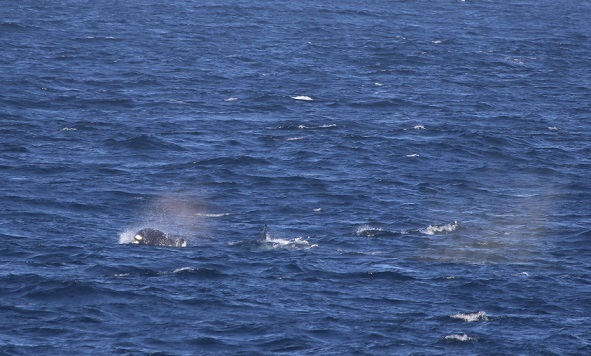 As we approached the area, we spotted one whale, and then another. 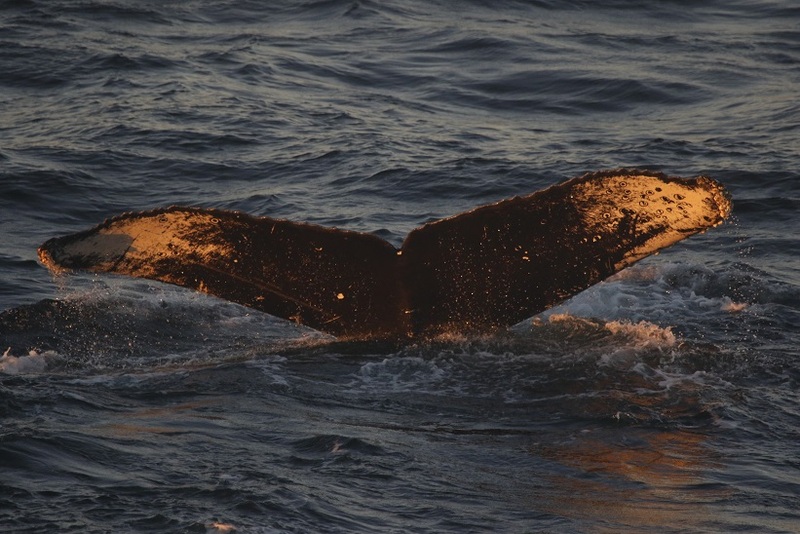 At first, our spotters had no trouble inputting the data, getting photo-ID shots, and distinguishing one whale from the next, but as we continued, we were soon overwhelmed. 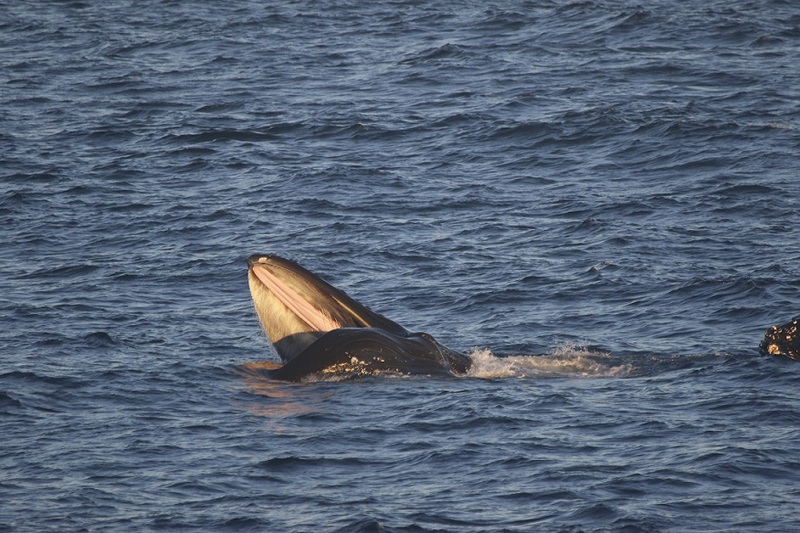 With whale blows surrounding us on all sides, it was hard to know where to look first – here a surface lunge, there, a breach, a spout, a fluke, a flipper slap! The surface activity was so dense and enthralling, it took a few moments before realizing there were some sea lions in the feeding frenzy too! We observed the group, and tried to document as many individuals as possible as the sunset faded into night. When poor visibility put a stop to the visuals, we hurried to do a plankton tow and CTD cast to find some environmental insights for such a gathering. The CTD revealed a stratified water column, with two distinct layers, and the plankton tow brought up lots of diatoms and krill. As one of the goals of this cruise is to explore how marine mammals vary with ocean gradients, this is a pretty cool way to start. A long day observing has left us all exhausted, but not too tired to share our excitement. Stay tuned for more updates from the briny blue!